Dead or Alive Volleyball isn't very hard to play. You don't have to think much to do well. 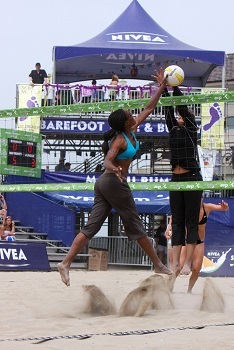 The volleyball consists of playing 2 on 2 (doubles) and you need a partner to play. The computer game is basically simple, the A button will hit the ball over the net, the B button will allow you to set the ball up so your partner can spike it. You have some fairly good control over your partner. For example, you can control whether they are up at the net or if you decide to play up there. When spiking, you just need to be sure you're hitting the A button at the right time, also when serving and doing other hits. To be successful at this volleyball game, the timing of spikes is important and also aiming where players aren't. Volleyball is one way to earn money on this island. The other way is by playing in the casino. You can play roulette and black jack. In black jack you can double down and get insurance when the dealer is showing an ace. The casino also has poker. It is more like video poker rather than like playing against anyone else. The casino also has slot machines. The machines are extremely basic. The main point of dead or alive volleyball is shopping. All these things you're doing on the island is for earning money. From there, you go to various shops and you can buy accessories or new swimsuits. Each day on the island there are new items in the shops. The stuff in the shops is basically for dressing up your girls in various ways. There's a wide array of swimsuits to choose from. You can also control what color the hair and nails are. Also, players can purchase sunglasses, ribbons, and different types of shoes. After a few days the items shop opens up. The items are pretty useless. They are basically there to just give you a goal to work towards. You can give girls gifts to butter them up to help convince them to partner with you. There are many graphics in this game, but simply aren't enough of them. Definitely during the volleyball portion, there isn't enough animation. This game could have been more real. This game is designed to survive on the visuals alone and simply isn't real enough. The soundtrack is basically tropical tunes with some pop music. Baha Men, The Spice Girls, and Christina Aguilara are on the soundtrack. There's about 20 songs with other various artists. In the end, this game really isn't very good. The graphics are the main focus and have their problems. The volleyball is very simplistic and likely won't hold your attention for longer than a couple days. The casino is not particularly well done. The shopping portion of the game feels forced. It seems like they were just trying to hard to create a goal to the game. Unless you're a big fan of Dead or Alive, you're likely better off just renting Dead or Alive Volleyball out of curiosity.